Does iWallet iPhone Mean Apple vs. PayPal? PayPal wants to be the go-to company for digital goods in a world where micropayments are becoming increasingly popular for mobile apps, tablet versions of newspapers, and music. The company announced its micropayment system called PayPal Digital Goods is no longer in preview mode and now available to any seller of digital content. PayPal Digital Goods allows for two-click payments without having to leave the originating site or service. The service has a low transaction fee threshold (5 percent plus 5 cents for purchases under $12), and offers one-time micropayments, pay-as-you-go, and subscription models. Carey Kolaja writing on PayPal's blog claims the fee structure is lower than those typically charged by payment processors in the digital goods industry, and, as always, payments are automatic and funds are immediately accessible. 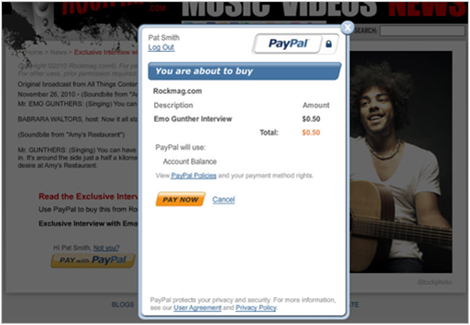 Seen here is an example of PayPal's micropayment system in action. PayPal's move to become the leading name in micropayments comes at just the right time: the mobile app industry is expected to hit $15 billion this year, and the virtual goods industry - such as add-ons to iPhone games like Angry Birds and stuff for FarmVille - is expected in 2011 to hit $2.1 billion. There is some skepticism as to whether people are willing to pay for virtual goods that cost as low as 25 cents, but one look at iTunes' economic model should alleviate those concerns. It used to be silly to use a debit card to buy a pack of gum. Now we're spending 99 cents on songs and app downloads without blinking an eye, and it's that same unthinking two-click agreement that will be a boon for the digital goods industry and PayPal, should PayPal become its leader.